Wild West: New Frontier is a new game from Social Quantum that lets you build and manage your own farm during the glory days of conquering the west side of the North America. 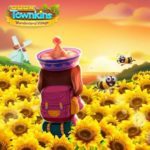 The game features beautiful graphics filled with cute animals and nicely looking buildings, a ton of stuff to do, and social element that allows for trading and helping friends in need. In Wild West: New Frontier, having a healthy farm that’s able to produce a number of different goods is quintessential, and if you fail to evolve your estate by saving up crops, efficiently fulfilling numerous tasks, and gradually increasing your household with new buildings, you may find yourself out of plants, out of ways to fulfill task, and finally, out of the game. In order to build an efficient and well-managed farm, you’ll need a couple of things, with patience being the most important out of them all. Other stuff needed for successfully conquering the Wild West is a sense for trading, a bit of entrepreneur spirit, and just a pinch of luck. Of course, there’s so much more to it than just that, but in order to successfully start your life on the Wild West: New Frontier not much is needed. The thing is, when you reach a certain level and when things become more serious, you’ll need some advice on how to pilot your farm to new heights, and this guide should provide just that. Stay with us and find out how to evolve into the most successful farmer ever to walk the Wild West: New Frontier. As with most other free-to-play games, Wild West: New Frontier revolves around two currencies. While gold can be earned in significant amounts, Westbucks are the premium currency that should not be spent on trickles. Use your Westbucks in order to upgrade important things, like improving your barn and granary and to be able to store more goods. Do not spend bucks on shortening the time needed for erecting buildings, or producing goods. Also, do not spend them on buying new production slots since you will be able to produce more than enough goods even with the default number of slots, which is two for most buildings. Next, never spend bucks on opening chests because they just aren’t worth it. Also, if you need some building material in order to expand the barn or the granary, look up the market first; there is always someone willing to sell special items, like the ones needed for improving buildings. Wild West: New Frontier is a social game, so be social! And by social we don’t mean to just send the invitation to all of your Facebook friends, that’s just not the way to get new allies in your campaign to build a farming empire. Instead of spamming your Facebook friends, start following people who bought stuff from your market. Also, when checking out ads, visit people who sell their goods at low prices; they are great to follow because there’s always a chance you will find what you’re looking for at their market, for a price that’s much lower than average. In fact, follow all players who you meet in the game, you never know what they might sell, maybe you will find an incredible deal that might miss you if you decide not to follow some random person who bought goods from you. Once you reach level 11 and finish with building telegram office, be sure to ask people for resources and goods, but don’t be greedy; share your surplus resources and goods, and people will share theirs with you. Just remember that you cannot make on your own (at least if you’re not planning on spending real money on buying Westbucks) so make sure to have lots of followers and friends in Wild West: New Frontier. Since you are a farmer, the most important thing is always to have enough crops that can be used for planting new ones. It is easy to always have enough crops, just don’t spend them all on making food and other goods. Always plant a bit of every crop, and never spend the last piece of corn or rye. It is easy; one seed gives you two plant pieces so making sure always to have something that can be harvested is the best way to grow your farm. And buy new land for growing plants as soon as it gets unlocked. If you follow the advice, you will probably have extra pieces of every plant that can be sold, and your granary will be filled to the top. Wild West: New Frontier offers lots of different production buildings that can produce hundreds of different items, but do not just produce every single one. Be careful with your resources and spend them on making just the goods needed for completing tasks. This way you will save up gold and resources and will be able to complete tasks at a faster rate, ensuring that you level up quicker. Of course, there are items that aren’t needed for completing tasks, but that is important nevertheless, like food for your animals. Make sure always to have enough food to feed all your animals once, so they can start making meat, eggs, milk, or whatever they are making. Check your animals frequently and make sure to collect the resource they make every time, and as soon are you finished with collecting them, feed the animals and go on and queue more animal food. In Wild West: New Frontier it is important to have a healthy production cycle, and you can achieve that only by being patient and timely. The market is a great way to stack up on gold, and you might think that putting lower prices on your products is an easier way to sell gods since your prices will be much more competitive than other people’s. But the truth is that you can put the max price on an item, and it will most certainly end up being sold, although it would need a bit more time to sell it than if you put a lower price. This is excellent because it gives you a way to earn lots of gold pretty easy, and if you managed to set up a healthy production cycle, you would be able to sell lots of crops, food, and even some expensive food (like nachos, or stew, or something else that asks for lots of ingredients). Although we said that you should focus on producing just the goods needed for completing tasks if you have lots of surplus supplies feel free to produce expensive foods and then sell them for max prices. 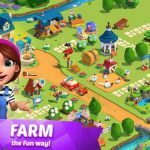 This will give you enough gold to always catch up on newly unlocked buildings and on buying new animals for your Wild West: New Frontier farm. Wild West: New Frontier gives you lots of land to erect buildings, but most of the land is covered in trees and large rocks, and clearing the land is more than expensive. You will have a couple of item pieces needed for clearing trees and rocks, but buying new ones cost lots of Westbukcs. So make sure to manage your free land like it is gold. Construct new buildings one next to another so that there’s no empty space between them, and if you have to clear a tree or a rock, make sure you will gain lots of space for new buildings. For instance, clear the land only when one element blocks you from erecting a new building. If you need to chop down more than one tree in order to have a new building, skip it since that will spend your tools quickly. So, manage your farm carefully, you have to plan accordingly in order to use all the free space. And remember, if you have to clear more than one tree or rock in order to build a new facility, just skip it. Your farm will occasionally be be visited by a couple of persons asking to buy your goods. Do not sell them your resources and food because you can get way more money by selling goods on the market. The NPC people wanting to buy items from you will offer laughable sums of money for them. For instance, they will offer like 10 or 15 gold for ten pieces of rye, and you can get five times more gold for the same amount if offer your rye on the market. There’s one scenario when selling goods to NPCs is okay. When you have to finish tasks for a special event (like hunts), it is okay to sell goods to visitors since you have to finish that task in order to advance the event. Okay, folks, that was all. We hope you found some interesting and helpful tips and advice inside this guide. 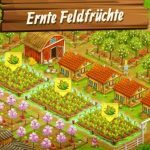 We tried to share all of the interesting tips with you and to help you build a huge and successful farm in the Wild West. Thanks for reading and happy gaming! Zoek mij rot naar timber voor de zaag wie weet het? how do you get horseshoes? I wound up getting the leader position dumped in my lap. How do I change the name of the coop? Please respond to email. Thank you. Where can we flollow you found this site on google randomly. Thanks. You can make goose feed at the millstone. You will see an circle like arrow at the bottom left hand side, click on the it gives you more options. If you’d like to join my hood your more than welcome it’s called wild west outlaws. How do I invite players to my farming community? How do you get pegs? How do I delete my chicken pen? I have decided not to raise them. How can i get stamps? You can’t delete chicken coops/ animals or any buildings you put up. If it doesn’t have a megaphone when you click on the tree then all you can do is cut it down. You can’t get someone to water it every time. Sometimes they die. What do cats and dogs, for that matter a Fox, add to the farm? Why get them? Do they help in any way? How do I fish, can’t figure it out? Watch the video…. if you can’t, then you put a lure in the designated area. Then it goes to a different screen and you hold down the fish thing until it’s in the green zone. Make sure it is in the green zone when your timer runs out. 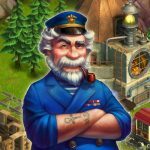 Do you have the sea sore opened which is next to the little helper as you need 6 bronze horse shoes to repair it once it is done then you click on the sailing boat which will take you to a new place. When there at the front of the pier you what looks like small shelves that is your storage place. Further back you have a fishing but now to the right you have a bit that makes nets.ro the left you have a board that makes fishing hooks so you just click on either building and u just drag what you want to the two empty boxes. If you’d like to know more why not join my hood it’s called wild west outlaws as we’d only be happy to help you more if you join. What should I. Make to get high points in the. Race? I have a friend that I could not follow because she had reached her limit of followers, she left our group and I want to find her, how can I do a search to find her? Do you know the friends name, do you have them on Facebook is so ask and they might tell you what neighbourhood she is in then you could join her if you wish or you could reduce the amount of people u are following then get her hoods name and click on her farm the click to follow her that’s another way. please evreyone can explain why the 9 free task in the race goes back to 8 free task? hope someone can explain. The amount of free tasks you have, will depend on what league your neighbourhood is in. Only federal gives 9 free tasks, if you finish in the bottom 3 positions in the race, your neighbourhood will be demoted, which means less free tasks. How can I sell my granary items to other players? How do you get the blank paper pen and ink and stamp to unlock more fishing spots? What do the bakery and loom produce? I want to start a new game for my Mom while she is visiting, she does not have a computer that the game will play on. Everytime I try to start a game for her it goes to mine. How can I start a second game. Add another user to the computer, then log into the new user and download and play. I’m at level 60 and my farm screen is black with dashes around where the buildings were only the crops are shown and I can’t visit friends. What happened? Do you have a guide in how to change leader to member. When you accept a person it comes up that I need to get out of my previous group I’m in and I’m no in a group anymore because I started my own. I would like to have a guide for the whole game if that is possible. What level do I have to be before I can participate in a race? Also, how do I collect prizes, if any, from previous neighborhoods? I’m new at this game. How i collect stamp. Parcel.hacksaw, ax. Shovel and etc. Quick which it belong. How do I gain more than 10 friends? It does not allow me to add more than 10. I wish I knew I am having the same problem!